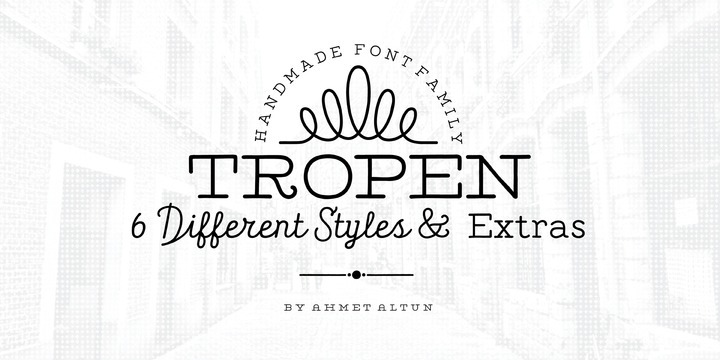 Tropen is an elegant handmade typeface created and published by Ahmet Altun. It provides various styles which are adaptable for all useful and contemporary purposes. Tropen Font Family also offers a wide collection of stylish decorative elements. All these typographic features put at the disposal of the users a complete set of ingredients which can be used for a wide range of design projects, such as posters, logos, t-shirt and magazine prints. A font description published on Monday, April 27th, 2015 in Ahmet Altun, Ahmet Altun, Fonts by Iulia that has 5,054 views.